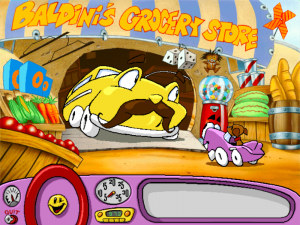 Between Putt-Putt Goes to the Moon and Putt-Putt Saves the Zoo, Humongous Entertainment released Freddi Fish and the Case of the Missing Kelp Seeds. Besides introducing a new franchise, that game also introduced higher quality paper-based animation. In 1995, these advancements were applied to the Putt-Putt series, resulting in a much prettier adventure game, if not one much more complicated. 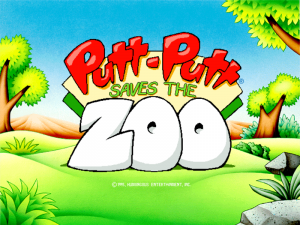 This visual change is the most immediately noticeable element of Putt-Putt Saves The Zoo. 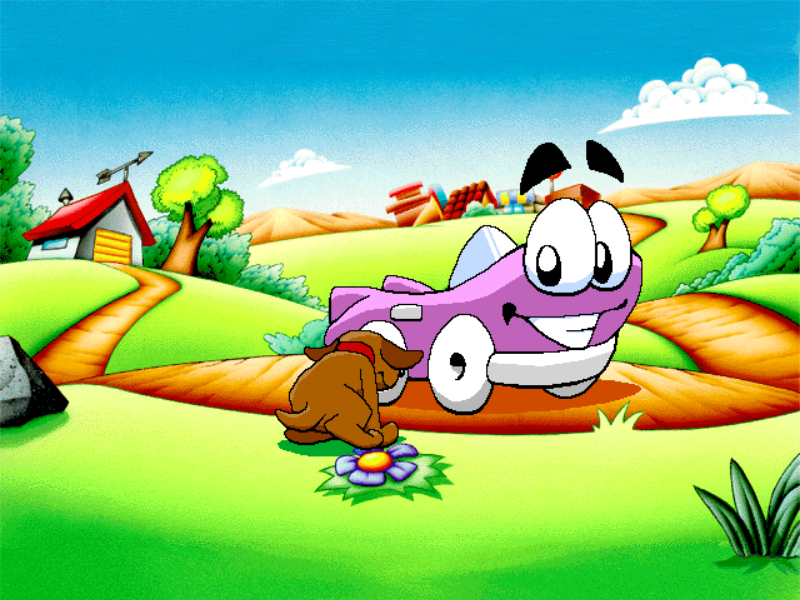 Putt-Putt and his dog Pep have been redesigned, and have many frames of animation drawn only for specific screens and shots. 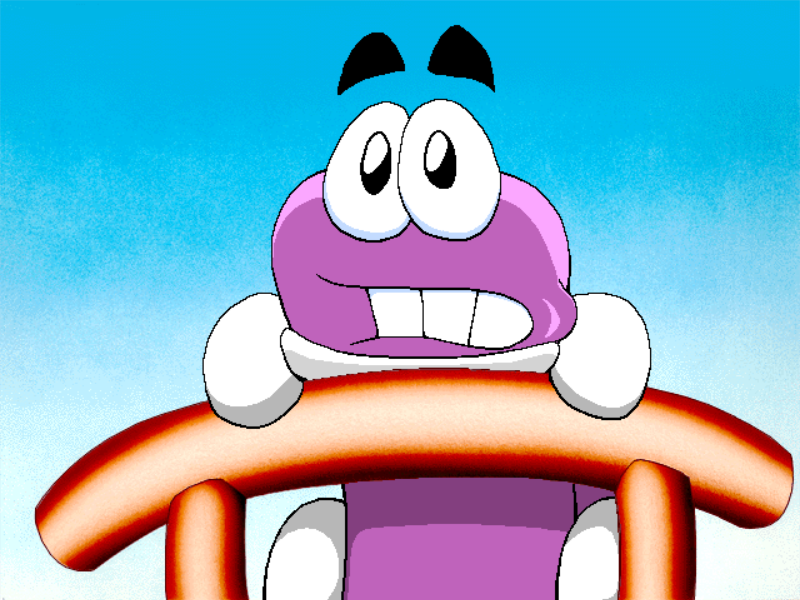 Putt-Putt’s eyes have become more vertical, and his shape is more defined, with many shots showing him from a variety of angles compared to the flatter looking prequels. He seems like he’s also been aged up a bit. 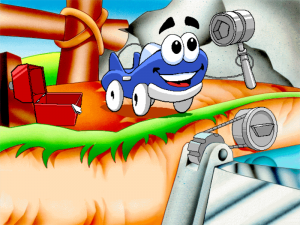 Jacob Ellefson, Putt-Putt’s child voice actor, seems to have aged between the past two games, making the character sound more grade school than pre-school age. Putt-Putt remains a constantly-smiling car without much of a personality, but the redesign makes him a lot more likeable nonetheless, and the same goes for Pep, who is now rather cute. Along with the visuals, Putt-Putt Saves The Zoo also offers a big step-up in audio quality for the series, perhaps owing the obsolescence of the floppy disk format. The redbook audio in the game was partially recorded live. While heavily compressed, it still sounds much nicer than the dinky midis of its predecessors. 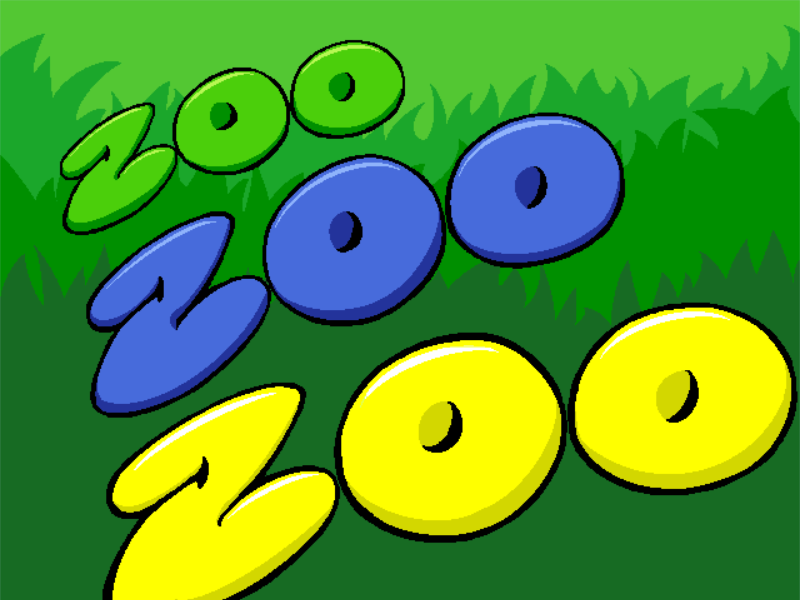 The music ranges from percussion and animal sounds to a couple vocal tracks, including “Welcome To The Zoo”, the game’s cute theme song. All these aesthetic elements lead up to a game that streamlines the adventure genre even further than its predecessors. 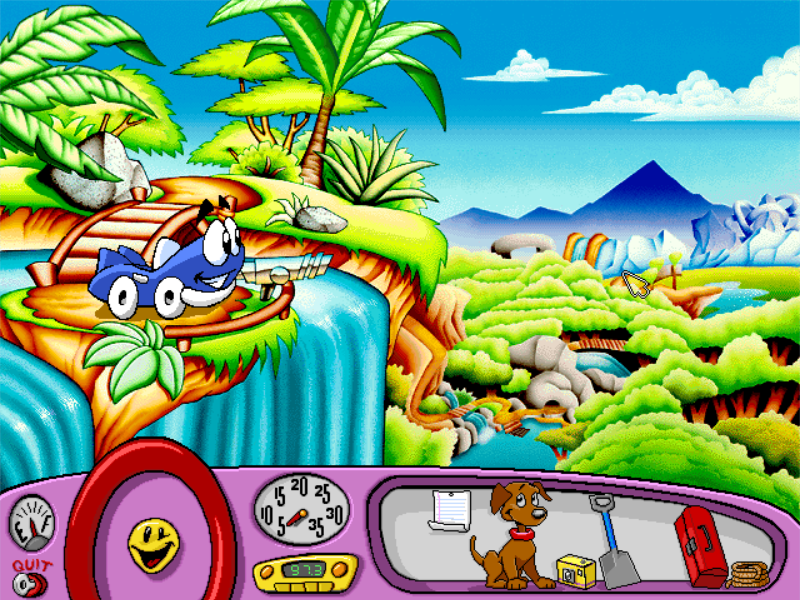 The open-endedness of the first game and the deep weirdness of the second are in Putt-Putt’s rearview mirror. It might be the most compact game in the series, again offering optional minigames and other forms of padding in place of offering more challenging puzzles. 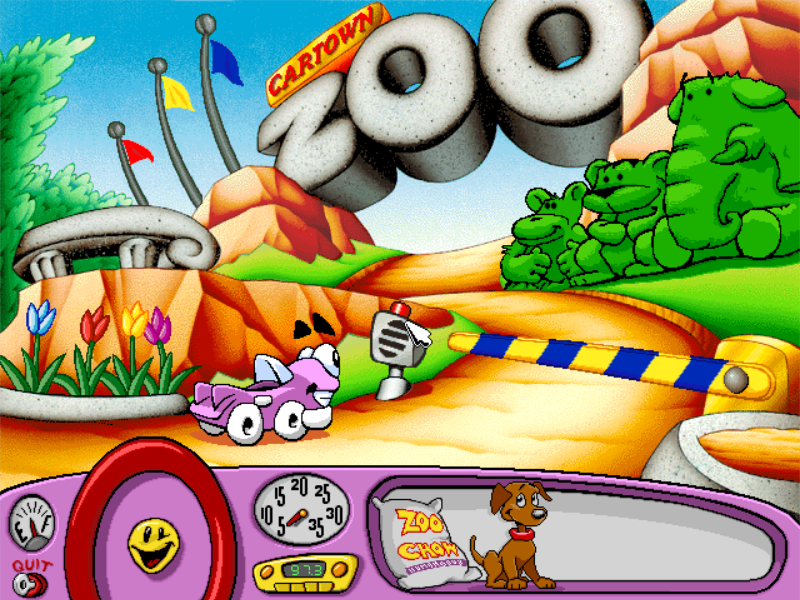 The story begins with Putt-Putt learning about the opening of the Cartown Zoo. 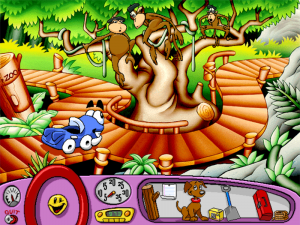 After delivering some Zoo Chow for the returning Mr. Baldini to the new zookeeper Outback Al, Putt-Putt learns that the zoo’s opening is in crisis. 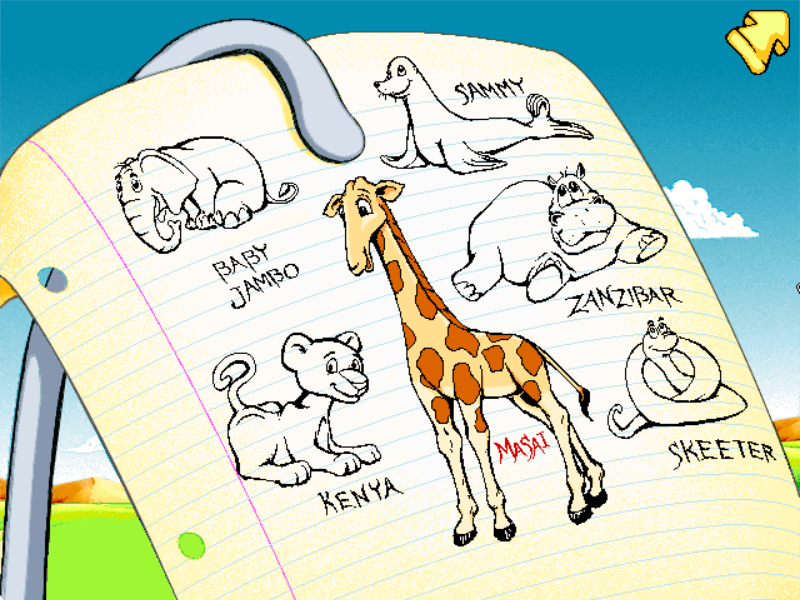 Six baby animals have gone missing. Putt-Putt, ever the good deed doer, tells the big-chinned Australian vehicle that he’d be happy to help. After pressing a button to page himself in, Putt-Putt’s adventure takes place entirely within the zoo. 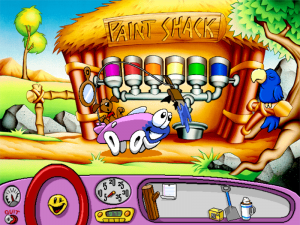 An opening plaza offers Putt-Putt the option to grab concessions, which he can use as items later on, and a camera, which he can use to photograph the many animals and characters throughout the zoo. Just about every character in the game can be photographed, even the plot-inessential ones. The zoo itself is a Disney’s Animal Kingdom style world where dirt-paved roads run alongside seemingly vast immersive landscapes split between a jungle, savannah and arctic section. 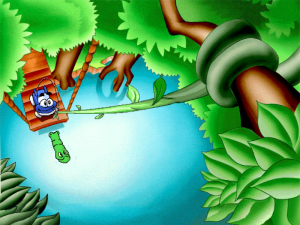 It makes for a lush environment compared to the previous games, while also allowing a decent amount of visual variety. Finishing the game requires visiting all three worlds, collecting items, and returning animals who have been estranged in the wrong area to their homes. 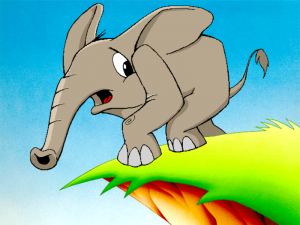 Sammy Seal needs to go back to arctic world, but is stuck in a closed dam in the savannah. Baby Jambo the elephant needs to return to the jungle, but is cornered by a mouse. Little Skeeter the snake is trapped in arctic world. 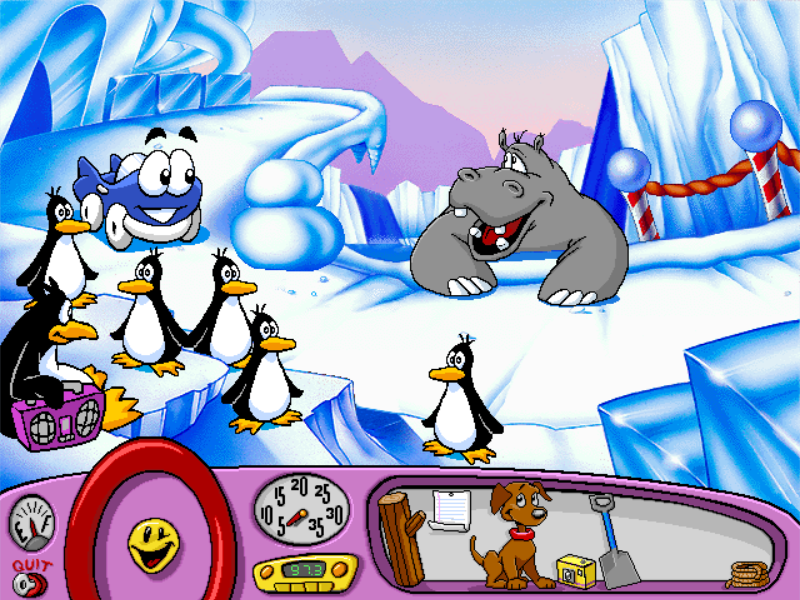 Zanzibar the Hippo is trapped on a block of ice in arctic world. 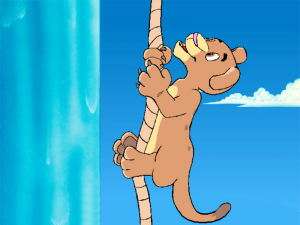 Lion cub Kenya is stuck on a ledge on a waterfall. Finally, Masai the Giraffe is stranded in the jungle. Putt-Putt’s work is generally about finding the right items to solve these animals problems. Advancing into the different worlds is also a challenge. 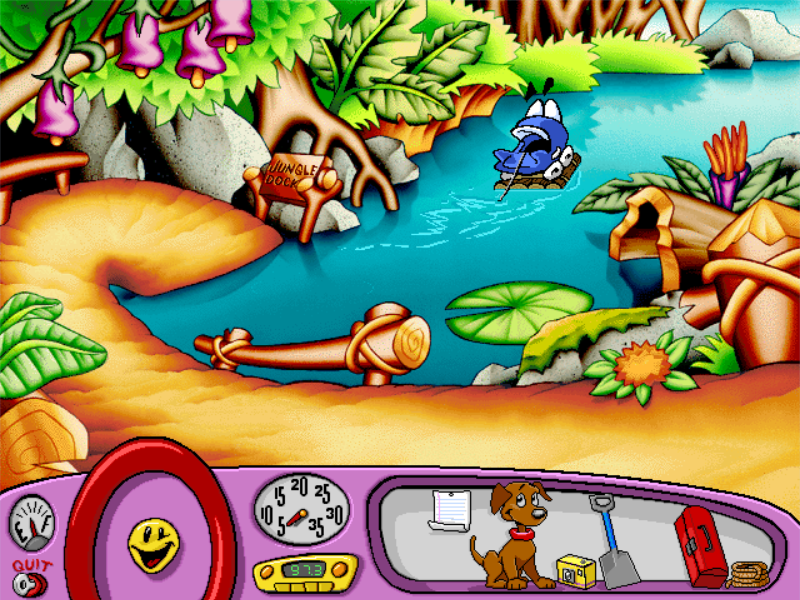 Putt-Putt will need to grab a shovel in the arctic area to move past an avalanche, and in the jungle area Putt-Putt will need to use a log found in the savannah to repair a raft. More interesting than the puzzles themselves are the little elements used to fill the world. 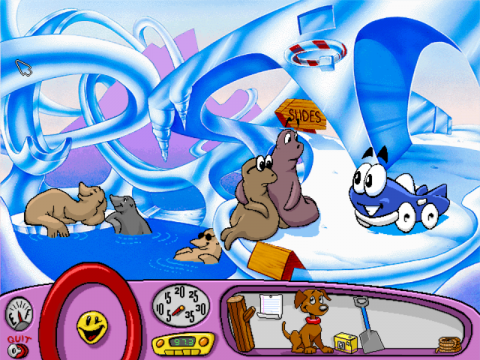 Each baby animal Putt-Putt saves has parents that can be seen before and after their offspring has been returned. They all have different personalities, and some are couples and some are single parents, which feels like an oddly conscious move. These parents never have to be interacted with at all, but they all just share stories about how they’re sad to be without their children. How they lost these babies is never said. The animals themselves are played adorably by child actors. The game is flush with Easter eggs. 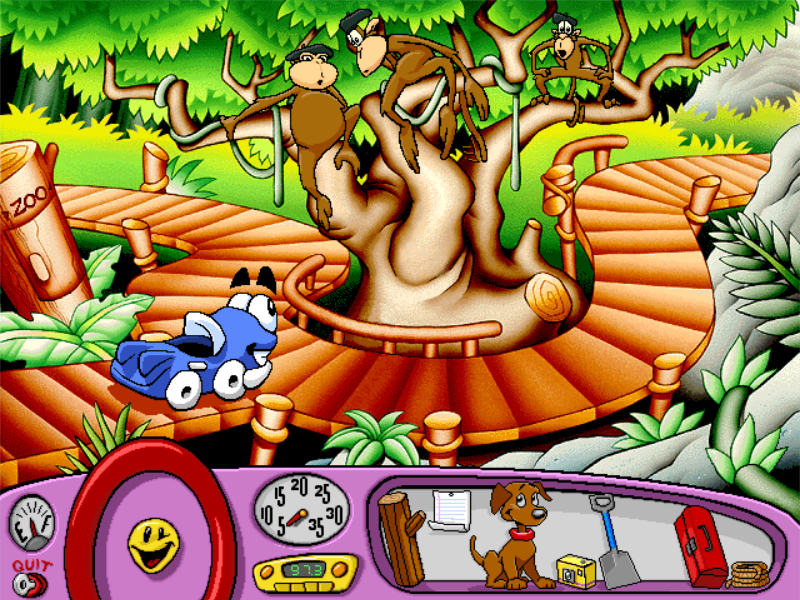 In a tree in the jungle world, Putt-Putt can meet some beatnik apes that rhyme together words to a bongo beat. 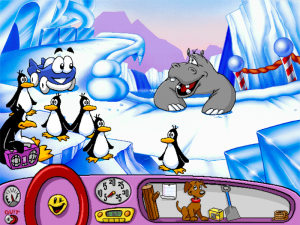 In another area, Putt-Putt and Pep can dance with penguins to a boombox. Perhaps the most wild easter egg is in the rapids segment. 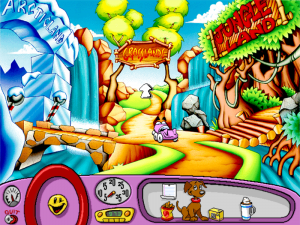 While basically just a series of set pieces that automatically take Putt-Putt in a loop, the player still has a chance on many of its screens to click his way onto an alternate path, eventually landing in a strange oasis area that plays the “Dueling Banjos” riff from Deliverance. Some omitted content goes even further. 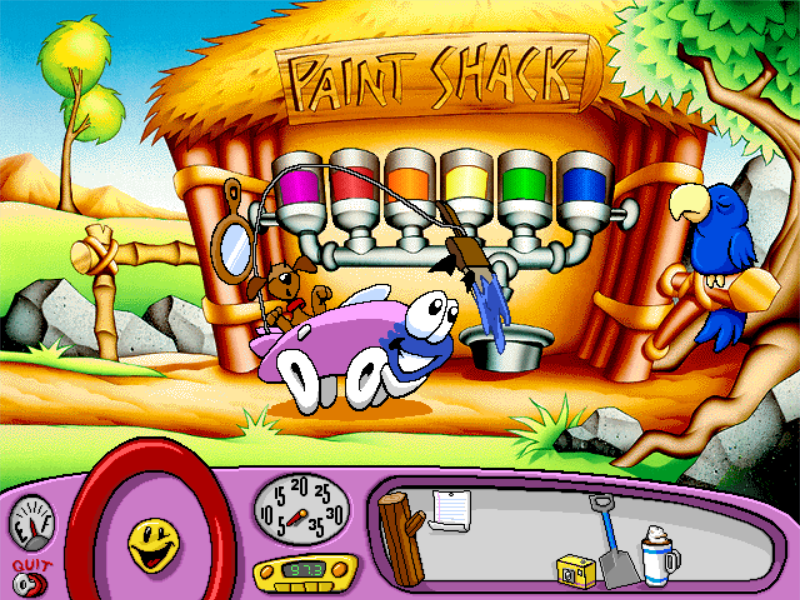 In debug mode, a cheat called “Upchuck” makes Putt-Putt vomit when he eats cotton candy at the concession stand. Not to be left out of this gag, Pep then jumps out and licks up the vomit. Besides its jokes, Putt-Putt Saves The Zoo is also made to appeal to the budding biologist. 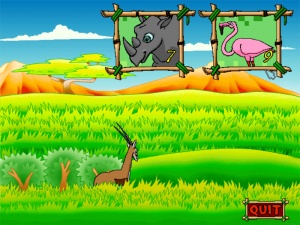 Nearly every animal found in the game sits beside a talking box that describes some basic facts about the animal. 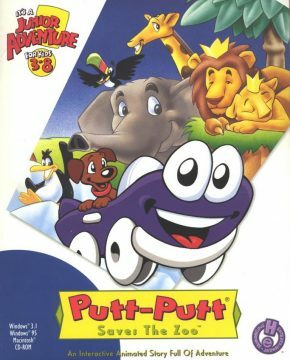 Putt-Putt can also, of course, photograph these animals, building up a library of polaroids that he can scroll through at a moment’s notice. 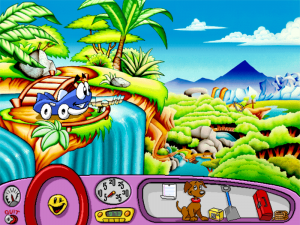 There’s not much for innovation in this game, but Putt-Putt Saves The Zoo feels much more like a complete product than its predecessors. The player can skip all animations by pressing escape, meaning the game can with practice be beaten in under a minute, but for those new to the genre, it’s a worthy introduction. 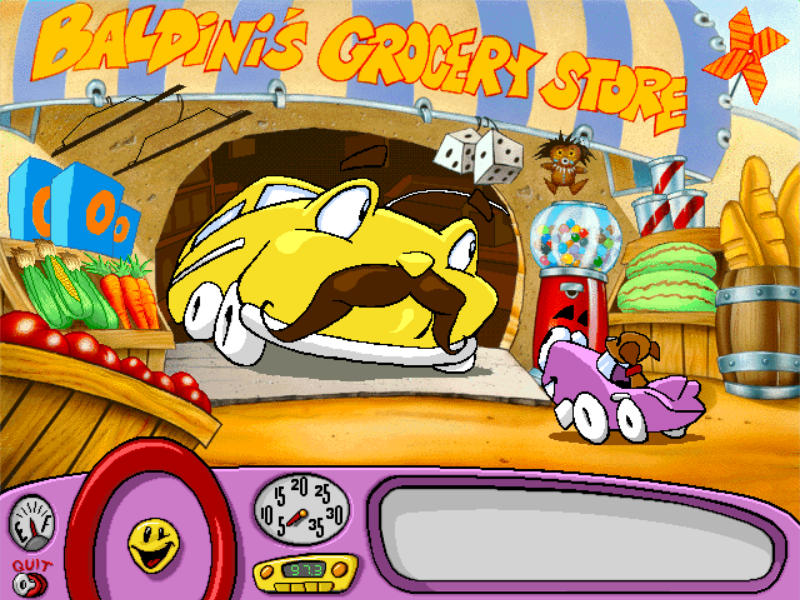 Like in the previous games, there are also various minigames, although neither are too deep. 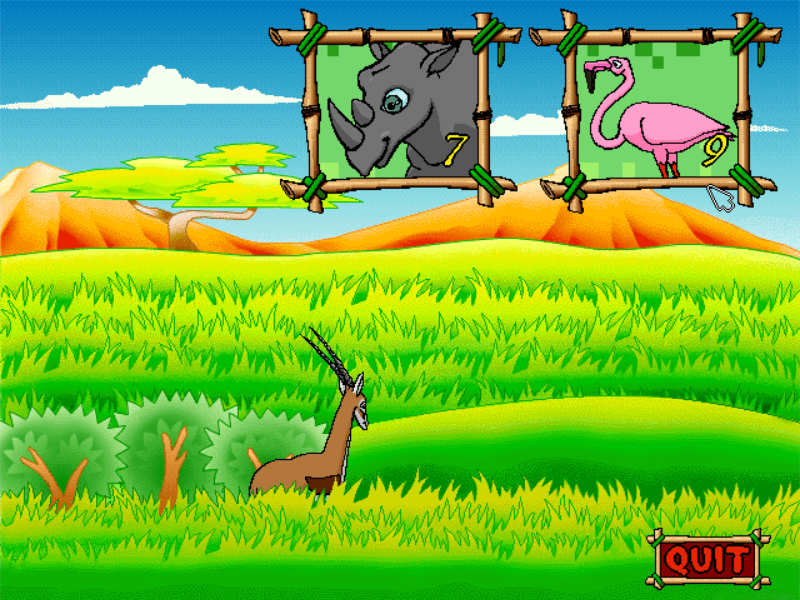 One is a simplistic click-the-animal type game, that asks the player to click a certain number of a couple animals. 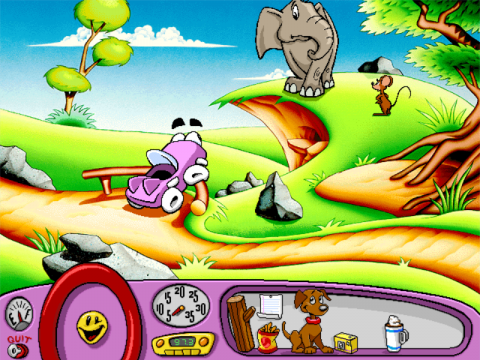 For a young child it might be fun, but anyone good with a mouse can easily play it even on it’s hard difficulty. The other game is a mouse-controlled version of air hockey, with Putt-Putt facing off against an anonymous polar bear. It’s certainly more challenging than the first, but is unlikely to hold the player very long. As in previous games, Putt-Putt can also change his color in this game, and it will stay that way through to the end. 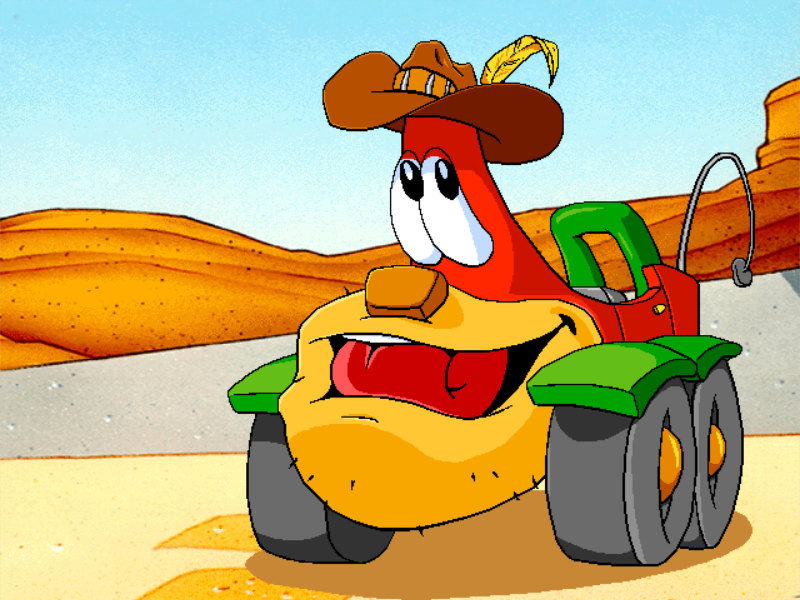 Putt-Putt Saves The Zoo ends with Putt-Putt receiving a medal for his efforts from Outback Al. The Cartown Zoo opens, and the player watches an overhead view of cars heading in and spreading out throughout the zoo. The credits roll with a series of photos of in-game characters in humorous situations, like Outback Al trying to catch fellow Humongous character Fatty Bear. 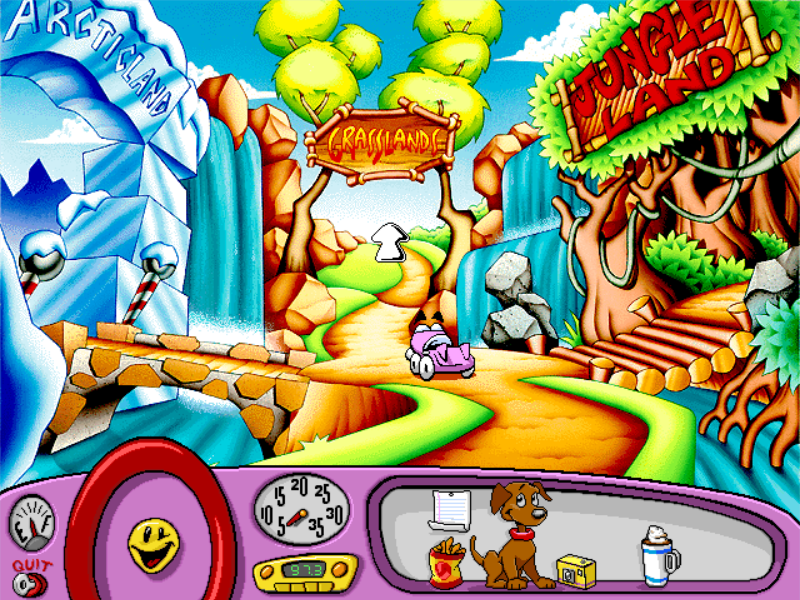 At the end, the player even gets to see photos of the young actors who played Putt-Putt and the baby animals while the game’s vocal theme plays. 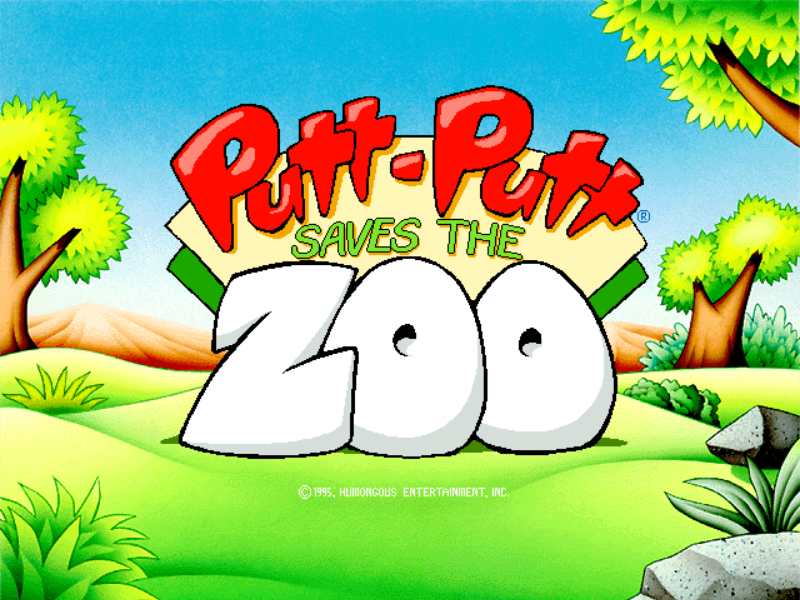 Like its predecessors, Putt-Putt Saves The Zoo stayed in print years after its release, according to one report selling 100,000 copies in 2001 alone, six years after its release. In 2014, it was released by Night Drive Studios for Steam, and by Nimbus Studios on iOS and Android through ScummVM. • More exclusives coming soon! Ever wonder if Doom is better than Rez? Find out every game's rank!. 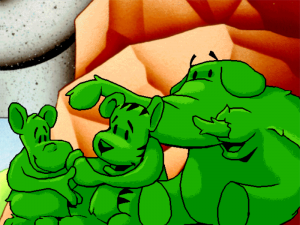 © 2019 Lenscap Theme by Array.